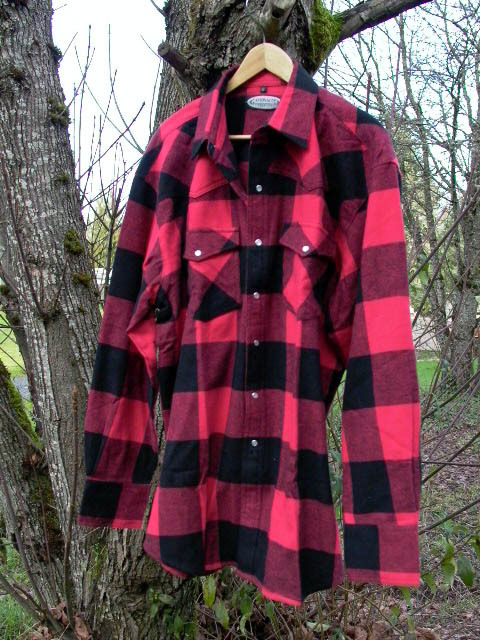 Canyon Guide Outfitters offers this traditional deep woods or "lumberjack" type of red/black plaid shirt. This shirt features cowboy type snaps for front closure, triple snap cuffs, and two chest flap pockets, also with snap closure. This flannel shirt is a blend of various synthetic fibers and reprocessed wool. It should be machine washed in cold water. Do not use chlorine bleach. Tumble dry on low heat. This type of fabric is soft and quiet in the woods, unlike most denim and nylon materials. The red/black plaid pattern is excellent for a hunting shirt, as it is visible to other hunters, and difficult for most game animals, who are color blind, to spot. To animals with black and white vision, red and black plaid serves as camo. Note that most predators are not color blind, and can see the color red. The only fly in the ointment regarding this specific shirt is that the snaps are synthetic mother of pearl and highly reflective. For use in the field, it is a simple matter to dab a little flat black model paint over the offending snaps. A Q-tip works fine for this purpose, no paintbrush required. Also effective for blackening the buttons is a black Sharpie permanent marker. I have seen shirts of this general type sold for upwards of $30, and for as little as $10 on sale at my local Bi-Mart discount department store. I like to buy my hunting clothes for next season at the end of the current season, when they are being closed-out. This is a heavy shirt that can be worn as a light outer garment over a T-shirt on warm days or as a shirt under a hunting coat on chilly days. It provides good insulation and works well as one of the under layers in a "layered" approach to keeping warm. I like to wear a T-shirt, long underwear, a flannel shirt, and a hunting coat in cold weather. In freezing weather I sometimes add a down vest between the shirt and coat. (And in severe winter weather I stay home or in camp by a fire!). In the fall, when the days may be pleasant and the early mornings and evenings chilly, you can wear the Canyon Guide Outfitters plaid shirt under your hunting coat and over a T-shirt while its cold. Shed the coat and wear your plaid shirt as a light outer garment when it warms up. Versatility is a good thing in the field.